UGC NET exam is round the corner and all the educational websites are flooded with articles on “How to prepare for UGC NET paper-I?”, “How to secure full marks in UGN Net paper-I and paper-II”, “Tips to crack UGC NET paper- I and II” etc. This article is not just about cracking UGC NET paper-I and II but about strategically nailing it. Here we will discuss the unique techniques that will help and strengthen your exam preparation. How is Testzone Test Series different from others for UGC NET 2018 Exam? At Testzone, we believe in root enrichment rather than shallow enhancement. To make it simple, firstly go back to basics and strengthen them before moving forward. At testzone we have the largest question bank of different pattern questions that will not just give you a wide scope for practice but also will remove your doubts and clear all the basics. Let us discuss 8distinguished qualities that give Testzone an edge over the others. Content is the backbone of testzone. We promise you to give away best of the best questions that will definitely better your journey of exam preparation. With the increasing competition, it has become essential to have a strong command over the topics that are coming in the exam. For UGC NET paper-I , there are 10 subjects from which 50 questions will appear in the exam, so one has to make all the concepts clear in order to conquer. With testzone, you can practice full length test with detailed analysis and intricate explanations that make us different from others. At Testzone, you will find detailed explanations of all the questions. These explanations are made from students’ perspective, which makes us stand alone from the others. If you talk about print media i.e. books, they completely lack in the explanation part. The motive of such step by step explanations is to virtually teach the logic to the aspirants, so that next time they won’t get stuck on such similar questions. Below given are the screenshots that will give you an idea of how a linear seating arrangement is solved considering each and every related aspect. Each thing that comes to us gives us a lesson whether good or bad. Similarly with each new test one has a lot of things to learn. 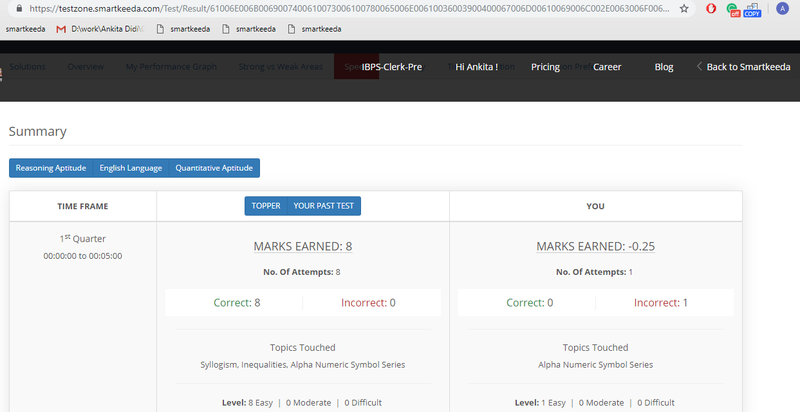 With this smart feature of Testzone, one can analyze one’s performance, mark the type of errors and can make efforts to overcome those shortcomings, so that in the real test one can definitely improve score. 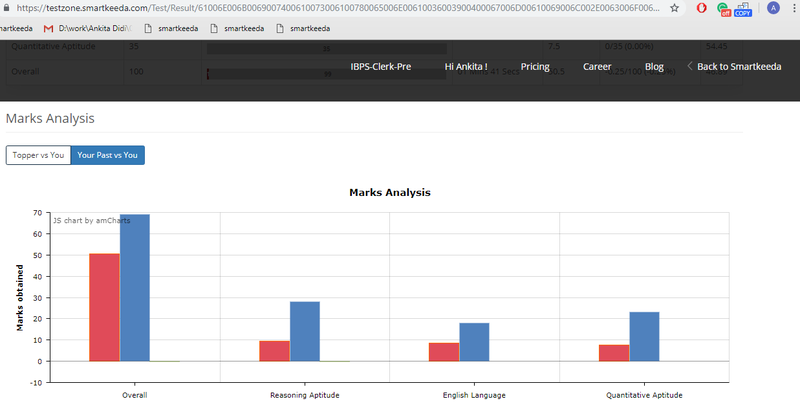 With the below given screenshots you can analyze the smart test analytics, how it works. 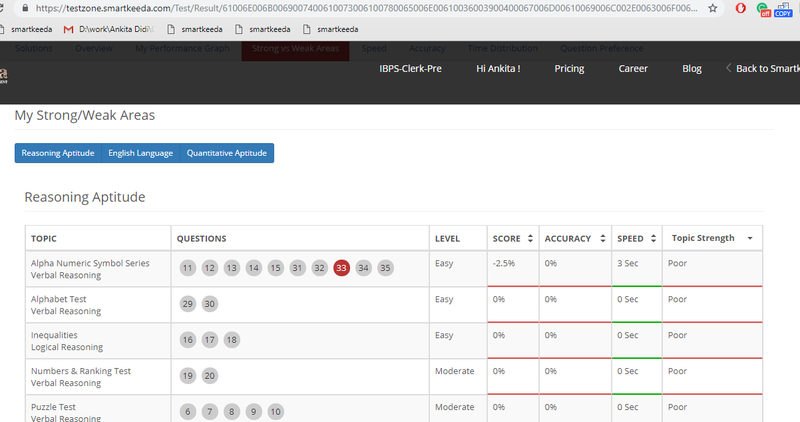 This analysis gives you in depth knowledge of the questions attempted and in how much time, nation-wide rank and the total time taken to complete the test. This feature helps in comparing the strategy adopted by topper with your own strategy. This in a way gives you a wider scope for improvement. Not only just with topper but you can also compare your score with your previous scores. This sort of analysis develops the tactics of learning from the past mistakes. Testzone performs SWOT analysis for the test takers. After the test one will have a list of strong topics and the topics which need more attention i.e. weak topics. This is definitely fruitful for the aspirants who are just a mark away from cracking the exam. After looking at your weak areas , practicing them and constantly watching out the progress path one can surely convert weaknesses into strength. At Testzone we know that Time plays a decisive role in Online tests and we take it in a serious manner. This is the reason why we have added one more feature i.e. the time-wise analysis. With which you can analyze the time taken on a single question versus the time taken by topper on that particular question. Also the average time taken to complete the test, moreover the quarter wise analysis, which helps in deciding the quarter in which you lag. This helps in making strategy for the real test. 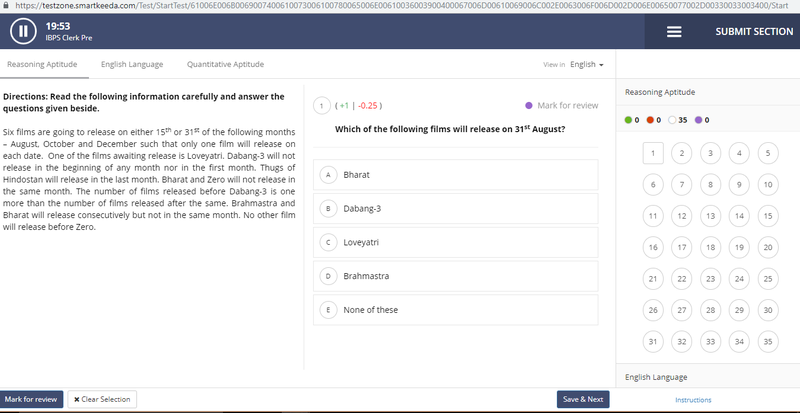 The motive behind taking a mock test is to have a feel of the computer based test that is actually going to happen. At Testzone, we value this emotion and thus have come up with an interface that is exactly same as the real time test interface so that once the user will give the actual test, he/she would be mentally prepared for the question paper, how it is going to come and certain other fears of an online test. This time UGC NET Paper-I and II will also held online, likewise the IBPS PO, Clerk tests. SO this will help in mentally preparing your for the real exam. With each growing test and after test analytics one can analyze one’s weak and string areas and can choose the questions accordingly. 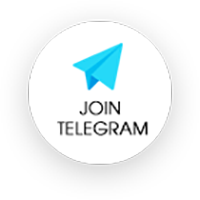 This will benefit the user two ways– A. The number of attempts will definitely increase if you attempt easy questions first , B. This will help in building confidence so that one can continue with same pace and technique in other sections of the exam also. With the upcoming exam i.e. UGC NET Paper- I, first time we have introduced a brand new feature i.e. Compulsory Attempt mode. Unlike bank and other competitive exams, UGC NET does not conduct negative charging and also one question is of 2 marks. Thus user can make a calculative guess to the questions on which he/she is not so sure. At Testzone, our objective is to enrich the user experience and give our best to improve your test experience.Whilw giving UGC NET Paper-I one cannot skip a question , one has to attempt it and then can move ahead only. Hope this information has assisted you in selecting the right preparation partner, as several exams like UGC NET Paper- I and II, CLAT 2019, IBPS Clerk Pre – Mains, Canara Bank PO are lined up, this much information is quite useful at this time for selecting the best of the best among the heap.